not so much afraid of the [illegible] young people as he was of the down sitting middle aged people who let things go. A number had written to out congressmen asking them to stand firm for the Prohibition Amendment and for temperance legislation. There were bills under consideration asking for: 1. The repeal of the prohibitory amendment. 2. The repeal for the Volstead Act. (This one had been set aside as if the prohibitory amendment stood there would be nothing to enforce it if the Volstead Act was repealed.) 3. To increase the percent of alcohol permitted in drinks which are allowed. 4. To give doctors more liberty in prescribing whiskey and liquor for medicine. The replies to all the letters were the same. 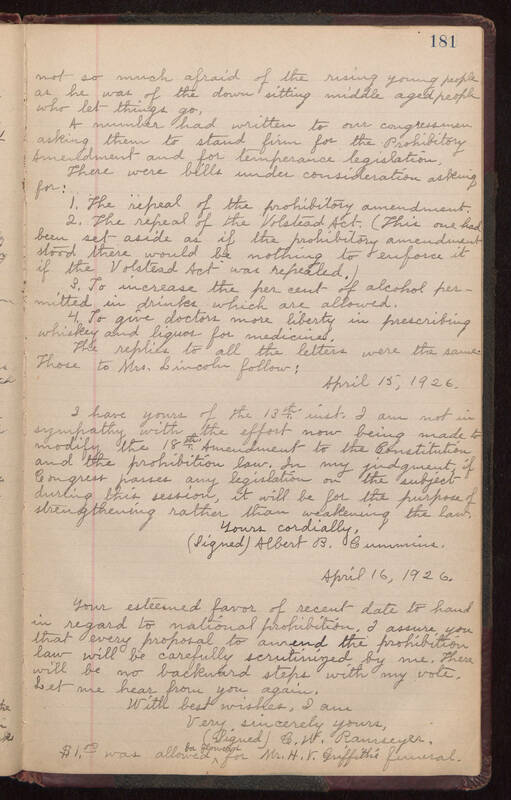 Those to Mrs. Lincoln follow: April 15, 1926. I have yours of the 13th inst. I am not in sympathy with the effort now being made to modify the 18th Amendment to the Constitution and the prohibition law. In my judgment if Congress passes any legislation on the subject during this session, it will be for the purpose of strengthening rather than weakening the law. Yours cordially, (Signed) Albert B. Cummins April 16, 1926. Your esteemed favor of recent date to hand in regard to national prohibition. I assure you that every proposal to amend the prohibition law will be carefully scrutinized by me. There will be no backward steps with my vote. Let me hear from you again. With best wishes, I am Very sincerely yours, (Signed) C.H. Ramseyer. $1.00 was allowed for flowers for Mr. H.V. Griffith's funeral.